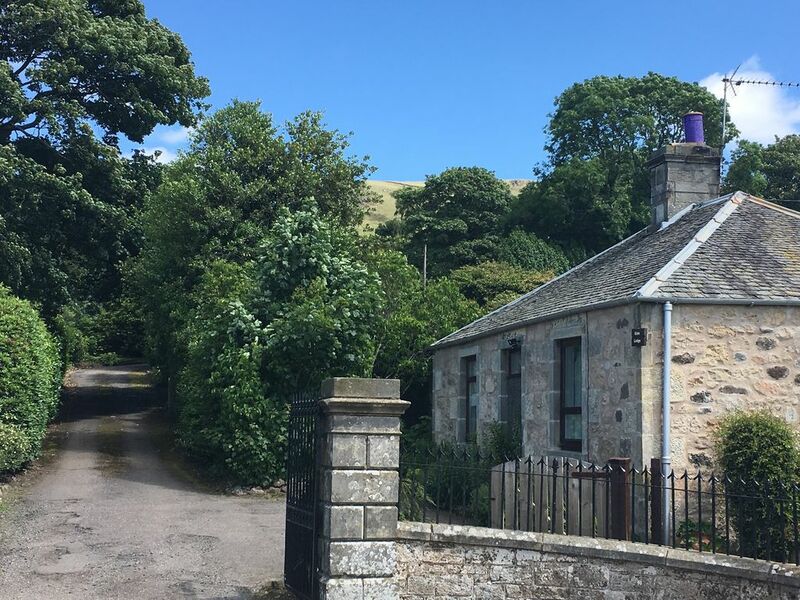 Balgedie Lodge is a charming Scottish holiday home, in Easter Balgedie, a small hamlet in Central Scotland, set between the dramatic Lomond Hills and stunning Loch Leven. The nearest town is Kinross with Perth and Edinburgh in easy reach along the M90, and Fife’s beaches and many wonderful golf courses all close by. Guests come back year after year to enjoy The Lodge’s homely charm, wonderful location and stunning views. The property sleeps five comfortably. There’s one double bedroom, a twin and a single, although the twin can be converted into a double on request, and an additional child’s bed or cot can be provided too, for an additional charge, but it must be requested at the time of booking. There is also a shower wet room (ensuite to the master bedroom) which is wheelchair accessible and a family bathroom with a shower over the bath. There’s a well equipped kitchen which makes it very easy for you to cook up some wonderful meals while you are staying with us. There's a dining table and chairs that can seat up to 6 and if you have a baby with you we can provide a high chair too. The sitting room has an lovely open fire which is very cosy in the evening - and can be very romantic too! There are some lovely comfortable sofas plus a flat screen TV and dvd player. There’s also lots of board games and books, and there’s even a piano for you to use too if you fancy a holiday singalong. The sunroom is bright and cheerful, and a wonderful spot for relaxing in and enjoying the amazing Loch views (the sunsets with a glass of wine in hand are a must!). And the beautiful garden, complete with bbq, garden furniture and a covered patio, is fully enclosed making it safe and easy for those with small children or pets. There is also private parking at the cottage. There's enough room for two cars and if you need any more space there is another spot on the other side of the garden you can use too. The cottage is all on one level, which makes it very easy for elderly guests or anyone who may struggle with stairs. it has been recently renovated to make it accessible for those with wheelchairs and mobility issues too. To find out more about this please do give us a call. We totally understand that dogs are very much part of many people's families and so they are very welcome to come and enjoy all the Lodge too, There is a small extra charge for this of 25 GBP and we respectfully ask that owners keep them off the furniture and do not allow them into the bedrooms as we are also aware that there are guests who don't have dogs and may have allergies. Also, whilst the garden is fully enclosed, if your dogs are very active they may try and jump it so we do recommend that you keep an eye on them. Saying that, many have stayed with smaller and older dogs and never had a worry at all. In the summer our new garden extension at the back of the Lodge will be complete and open for all our guests to use. This will be a fully enclosed, totally safe area where dogs can run about without any worry of escaping. And children can play there too. Infact it will be somewhere for everyone to enjoy! All prices quoted include heating and electricity, luxury bed linen, towels, a basket of logsand a welcome pack. We also provide you with coffee, tea, sugar, milk, toilet roll, washing up liquid and general household cleaning stuffs too. Smoking is not permitted anywhere inside this property but is allowed in the garden. There are loads of things to do when you come and stay and in the house is a folder full of suggestions and brochures to help you decide what would suit you best and our website has lots of info on it too. But with so much to choose from we are very happy to help you plan you stay - just let us know what your interests are and we can guide you as best we can! The neighbouring village, Kinnesswood has frequently won the prize for the Best Small Village in The Keep Scotland Beautiful Awards and holds it this year again. A wander through its old cottages and lanes is a lovely way to spend some time, before heading back to the cottage for tea! There are lots of other lovely walks close by too - there's a new path/cycle route that runs all round Loch Leven, RSPB Loch Leven is at the south end of the loch and there are a couple of excellent farm shops to stop at for snacks and meals. There's also Castle Island, that you can see from our cottage. Mary Queen of Scots was imprisoned there and there are boat trips out to it in the summer for you to have a look around. It really is a must-go-and-see and has a great picnic spot! The Lodge is also fantastically situated for those who want to walk to a pub or restaurant. Less than half a mile down the road is Balgedie Toll Tavern, a great local pub, and just a little bit further is Loch Leven's Larder, an award winning deli, cafe/restaurant, and gift shop. There's also The Well in Scotlandwell which is a great pub too. All are family friendly and dog friendly too! Kinross also has lots of places to eat and there are some other special places we can recommend to go to too. Please contact us if you'd like to know more. If you are on face book you can find more details about the cottage there too, under Balgedie House and Lodge. On the page there are lots of links to many activities in the area and its a great place if you'd looking for info and ideas of things to do when you come to stay. I am a mother, wife, theatre director and very proud Scot! Currently I live with my husband and 3 boys in Singapore and whilst I miss being in Scotland hugely I love being able to help others have a wonderful time there. In Singapore, alongside managing Balgedie House and Lodge, l also work as a director of an luxury boutique hotel group called RAAS, in India. Whilst my role with them is quite different to my role managing Balgedie House and Lodge, ensuring guest have wonderful stays and experiences are paramount to both. We bought the Lodge as we already owned Balgedie House at the end of the drive. When the previous owner, Fiona, kindly asked it we would be interested in it, we were delighted. Balgedie Lodge had historically been part of the same plot as the house and so we were thrilled to be able to bring them both back together again. When we bought the Lodge we were also in the process of renovating Balgedie House and so we absorbed it into those renovations! It became a massive project but we are so pleased with the results and there is nothing more rewarding than hearing how much guests have enjoyed their stay as well as enjoyed discovering all there is near by - from golf courses and whisky distilleries, incredible bird life and walks, to art galleries and museums. Also having both properties means that we can offer a variety of options to guests. For larger numbers we would recommend the House or both the Lodge and the House together. For all enquiries about taking the House and the Lodge together, please contact us via our website or face book page. The view is simply stunning and it is constantly changing depending on the weather. You almost have to see it to believe it, but every day is different and all are magical! Every season has something to offer too. One of my favourite things is watching the geese in the winter come down to land and graze in the fields between ours and the loch. I also think it is fantastic to feel so remote but at the same time know you can get to so many of Scotland's major towns so quickly! It's a wonderful balance and pretty rare to find! There are very few spots where you can be so close to so many of the wonderful parts of Scotland but also feel you are simply in the middle of nowhere! This helps make it a perfect holiday spot. We also have a fantastic team on the ground who not only make sure the House and Lodge are presented beautifully but they are also there to greet guests on arrival, make sure everyone is settled and has all they need, but they are also on hand should any thing be needed or happen during a stay. May be it is my experience in luxury hotels, I'm not sure, but I firmly believe that we all deserve something a little special every now and again, and my aim is to offer that to everyone who comes to stay. Comfy sofas, piano, open fire, TV, digibox, DVD, coffee table, lots of books and board games. Nespresso machine and milk frother. There are some capsules left for guests although if you like coffee then it is recommended to bring your own! Various items usually in pantry eg, sugar, salt, pepper, some sauces, veg oil, etc. We also leave some fresh milk in the fridge and a little welcome gift. There is a round dining table in the kitchen which can seat 6. There is also an outside dining table for outside eating and BBQs. Music for piano and guitair and also a good selection of CD's for guests to use. Covered patio with benches and table and an outside stove fire to keep you warm at night while watching the stars! 1 mile to local 9 hole course(Bishopshire). Many other wonderful courses nearby in Kinross and throughout Fife and Perthshire. Less than 30 mins to Gleneagles and St Andrews Old Course. The cottage has been recently renovated to make it more accessible for wheelchair users. The cottage has always been on one lever but the doors have been widened and there is a wetroom/shower room which is designed for wheelchair users. We would recomend however contacting the owner directly to discuss the accessibility to be sure that it will work for you before booking. Notes on accommodation: All electricity and first bag of wood and kindling for fire included. Outside: Pretty, well-stocked garden with garden furniture and barbecue. Shed for bikes. Cleaning / Towels / Linen / Maid service: All linen and towels included and can be changed depending on length of stay. The sunroom is a favourite amongst guests with exceptional views of the Loch. This is relaxing and stylish accommodation -perfect for an enjoyable holiday. Gorgeous pastel colours make for a restful stay. Everything is provided for you and it is spotlessly clean. There are glorious views of Loch Leven with spectacular sunsets. It is great to find a property where the owner has worked so hard to make their property accessible for disabled guests. A lovely cottage in a great location. The view of Loch Leven and the ever-changing sky above it is mesmerising. The cottage itself is comfy and nicely equipped with everything you need. Great location for exploring Loch Leven and the famous castle. Good beaches nearby - we loved Burntisland. A lovely place from where to explore this part of Scotland. A welcome pack and fresh milk in the fridge on arrival a lovely touch. Nice to meet such a lovely owner for whom nothing was too much trouble. Very comfortable house, well fitted out, superb sunroom with wonderful views of Loch Leven. Lovely enclosed garden with good outside furniture and barbecue. Rather noisy as right on the road and not easy to get out of driveway. Owner very friendly and welcoming. We stayed here just as the snow was melting at the beginning of March and were thankful to have made it here! We found the lodge to be beautifully clean, very well equipped and cosy with amazing views. The Sun room is perfect to wake up to, while the lounge is perfect for snuggling around the log fire. Shona and Mary are also very welcoming and left welcome gifts displayed in a pretty basket ready for our arrival. The bed is amazingly comfortable too which is important after a long day of exploring the many interesting places around! Thank Shona and Mary for a lovely stay we couldn't have asked for more! Wonderful, cosy and comfortable cottage. We’ve just returned from a lovely short break and can highly recommend staying at the Gate Lodge. Super-comfy beds, soft, thick towels, a well equipped kitchen and cosy sitting room with an open fire are just a few of the features we loved. Thanks for the wine and biscuits that were waiting for us on arrival too! Locally, there are many wonderful walks, a cycle path and walking track around Loch Leven, the RSPB at Vane Farm, the Lomond Hills on the doorstep and there are several great farm shops, cafes and restaurants. Two are even in walking distance - Balgedie Toll Tavern is a super local pub and Loch Leven's Larder is very spoiling for delicious lunches, cakes and coffees as well as having a deli and a fabulous gift shop! Just along the road from Easter Balgedie is Kinnesswood - it's a gorgeous little historical scottish village which has won Best Small Village in the Beautiful Scotland Awards many years running. There are some lovely walks amongst some of the old houses and little lanes, a museum in honour of the famous poet, Michael Bruce, and a local pottery shop too. There's also a little shop which stocks the essentials and the paper and a very friendly garage too - one if those rare special ones where they still operate the pumps for you! Kinross itself is a lovely town with many little shops and restaurants. A trip on the little ferry across Loch Leven to the island to see the castle Mary Queen of Scots was imprisoned in is an absolute must! Milnathort also boasts some great cafes and a deli. The Gate Lodge is also an ideal base to explore many other famous Scottish sights. Perth is only half an hour away and Edinburgh's only about 40mins. And there's Stirling, Gleneagles, St Andrews and Dundee, all of which are doable within the hour. The beaches along the Fife coast are definitely worth an explore - in the sunshine and the rain! Elie is a great favourite, not only for a trip to the beach and the lighthouse, all the watersports, golf and tennis, and also for The Ship Inn, an award winning local pub on the harbour wall. And there's Crail and Anstruther too - amongst them all you'll find loads of children's activities, adventure parks, bowling, a corn maze, deer farm, animal farm, and so much more. Oh, and some great fish and chips too! The wonderful new Helix Park and the famous Kelpies, the largest equine structure in the world, is only 40 mins away too. There is so much to do for sporting enthusiasts too. The choice of golf courses is vast - there's the lovely local, 10 hole course and putting range in Bishopshire Course in Kinnesswood, several in and around Kinross and throughout Fife, as well as the famous ones close by in Gleneagles and St Andrews. There's a gliding school very close by and if you don't dare trying it out you can enjoy watching the gliders elegantly flyiing over head as they use the thermals from the hills behind the house! Walking, fishing and cycling are also very well catered for and there is enough to suit all, from beginners to experts! There are also many things to do culturally, many of the main towns and cities boast arts Festivals and Fringes - Edinburgh being the most obvious but there are many other smaller ones too - and there are many theatres and concert venues which have lots going on throughout the year to enjoy as well. Distances to key towns and cities: Kinross - 4 miles. Dunfermline - 15 miles. Perth - 18 miles. St Andrews - 25 miles. Stirling - 30 miles. Dundee - 30 miles. Edinburgh - 35 miles. Glasgow - 50 miles. Check in time is from 4pm on day of arrival and check out time is by 10am on departure day. Early and late check in's may be possible but are at the owners discretion and must be agreed in advance no later than 30 days before arrival.